Eat at Chipotle on Monday, March 2nd & support ProGrad: 3 TO 7 PM ONLY!!! (6245 HWY 6 in Missouri City) . Let cashier know you are there to support Elkins. CHIPOTLE (MISSOURI CITY, 6245 HWY 6): 3 TO 7 PM ONLY!!! 50% goes to ELKINS PRO-GRAD 2015!!! Let cashier know you are there to support ELKINS! Any questions, ask Sara Gann at sara.fina@comcast .net. Very Important! Please remember to mention to cashier that you are there to support the fundraiser for ELKINS HIGH SCHOOL from 2pm till CLOSING at 9pm! Points| Sign-in sheet and receipt with name in the bucket by register...GO KNIGHTS! Tour First Choice Emergency and earn points for raising $$$$ for Pro-Grad. 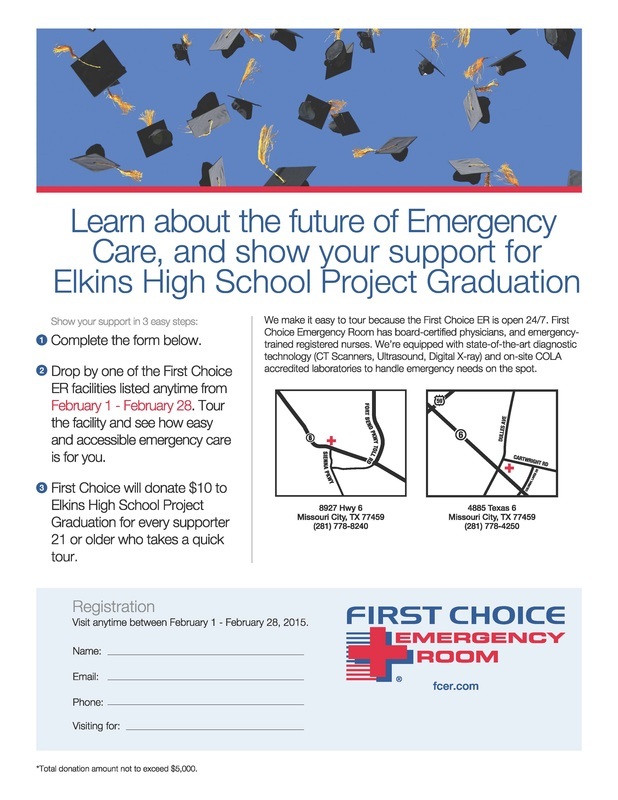 Visit FIRST CHOICE EMERGENCY (next to Fuzzy’s Taco and/or intersection of Sienna Parkway and Highway 6, 8927 HWY 6 and/or 4885 HWY 6) in Missouri City and RAISE $$$$$ for PRO-GRAD and POINTS for prizes!!! How? Take attached flyer and tour location at anytime during February and E-mail Sara Gann at Sara.fina@comcast.net so she can track your points. Each visit raises $10 for Pro-Grad and 1000 points for your senior ---GO KNIGHTS!!!!! 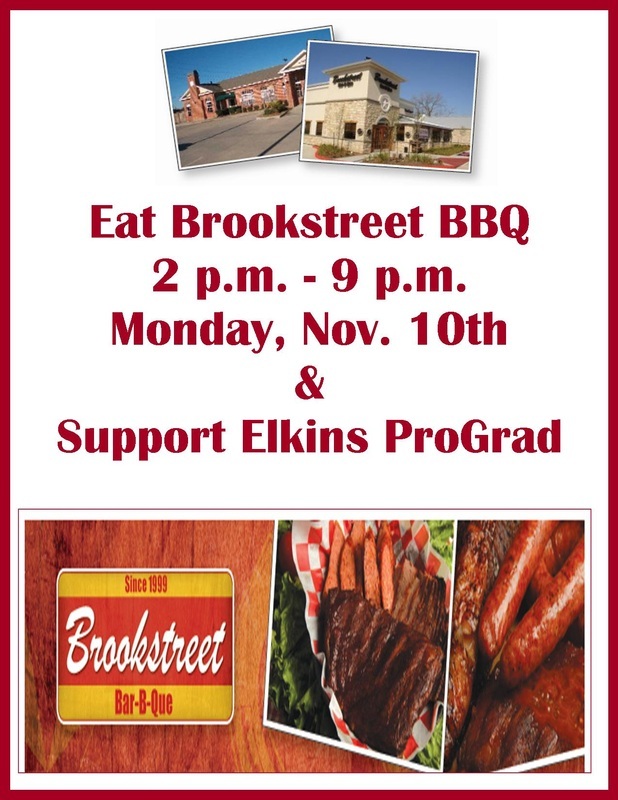 Eat at Brookstreet BBQ on Monday, Nov. 10th from 2 p.m. - 9 p.m. & support Elkins ProGrad! Wear ProGrad shirt for bonus points! MONDAY 11/10 -- Brookstreet BBQ from 2pm till 9pm: Tell cashier you are with ELKINS PROGRAD to help earn funds from 2 till 9pm. Points: Write name on receipt and place in bucket. Extra Points: See Pro-Grad Volunteer from 5 till 9pm if you are wearing your PROGRAD T-SHIRT for 1000 BONUS POINTS!!!!! And during the week leading up to the garage sale: Tues, Wed, Thurs, Fri (Nov. 11,12,13,14): 4-7pm. These dates and times are advertised via all our social media sites and on www.elkinsprograd.org. 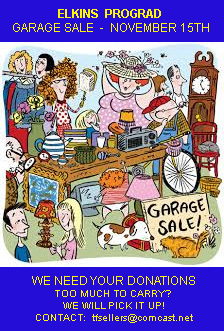 More information will be sent out as we get closer for volunteer opportunities for the garage sale. Also, The First United Methodist Church of Missouri City, where we will be having our garage sale, will be having their fall festival on Saturday, November 8. Students can sign up on signupgenius to volunteer to help. There are also opportunities for Friday evening, Nov. 7th, to help set up. The link is below. This is a great way to show our gratitude for allowing us to have our garage sale at the church! For each hour of volunteering, students will receive 1000 points! They can sign up for as many hours as they want. Please email Tanya Sellers @ tfsellers@comcast.net for additional information. Thank you for your support! 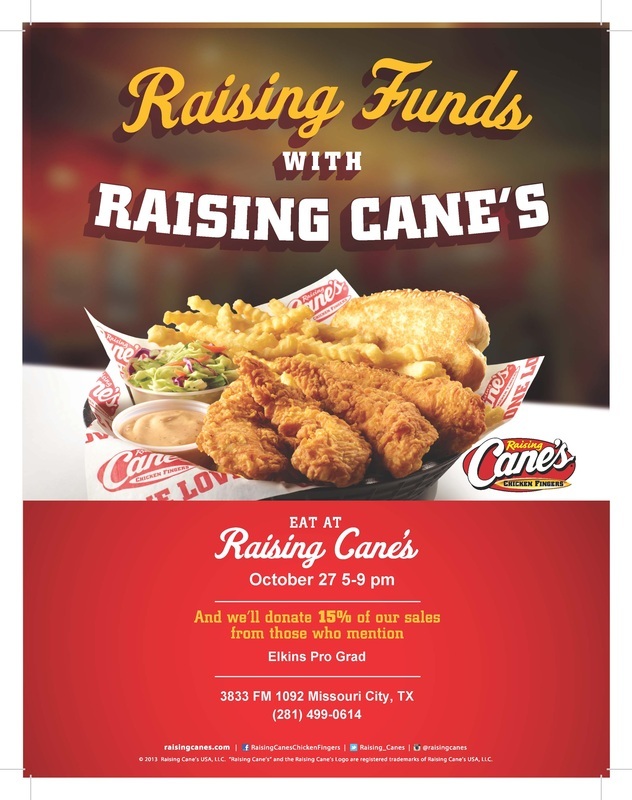 Eat at Raising Cane's on Monday, Oct. 27th from 5 p.m. to 9 p.m. and support ProGrad! MONDAY 10/27: CANE’s: 5 to 9 pm: Tell cashier you are there to support ELKINS PRO-GRAD! . Points: Write name on receipt and place in bucket and/or see Pro-Grad Volunteer from 5 till 9pm if you are wearing your PROGRAD T-SHIRT for 1000 BONUS POINTS!!!!! EHS ProGrad Poinsettia Sales: Oct. 15th - December 3rd. Cost is $11 each. Choose your favorite -- red, white, pink or winter rose! EHS ProGrad is proud to announce its Poinsettia Sales Contest! The competition for the top seller runs from Oct. 15th - December 1st. All Elkins High School seniors can take orders. The cost is $11 each. Available colors are red, white, pink, or winter rose. Delivery date is Wednesday, December 3rd. The top student seller will receive 25,000 points towards ProGrad events! Second place will received 15,000 points and the third-place seller will receive 10,000. Orders can be turned in on Thursdays during lunch at the ProGrad Table. Sales forms available online @ elkinsprograd.org. Deadline to turn in orders is Wednesday, December 3rd at lunch. Winners will be announced after the December ProGrad Meeting. Please email yo_1971@att.net if you have any questions. ProGrad Spirit Nights: Monday, 10/13 Brookstreet BBQ from 2 p.m. to 9 p.m.
MONDAY 10/13 Brookstreet BBQ from 2pm till 9pm: Tell cashier you are with ELKINS PROGRAD to help earn funds from 2 till 9pm. Points: Write name on receipt and place in bucket. Extra Points: See Pro-Grad Volunteer from 5 till 9pm if you are wearing your PROGRAD T-SHIRT for 1000 BONUS POINTS!!!!! 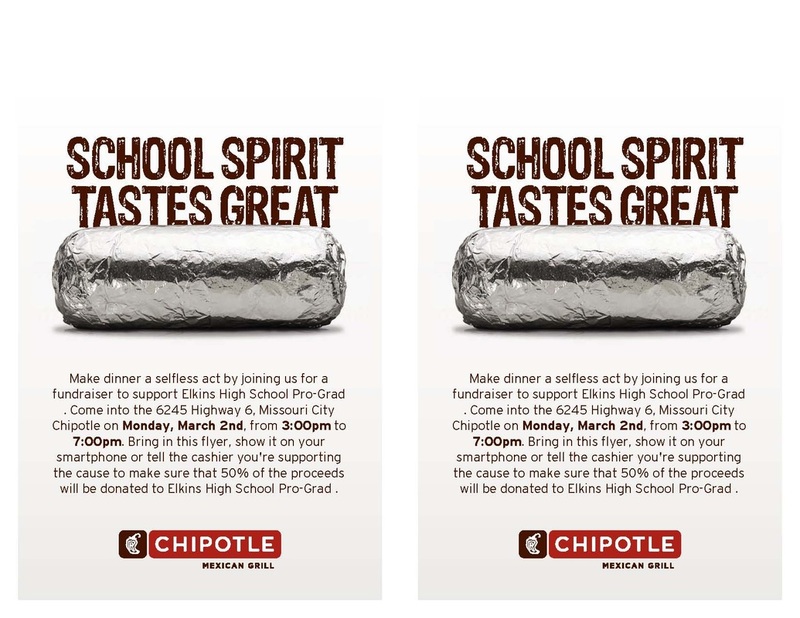 Pro-Grad 2015 SPIRIT NIGHT at CHIPOTLE (Missouri City) from 3 to 7pm ONLY on Monday September 29, 2014 . 50% of proceeds from sales from our students, families, faculty and friends that tell the cashier (verbally communicate, show flyer or show flyer on mobile device) will raise $$$ for Pro-Grad and for our students!!! POINTS: Request duplicate receipt (Student’s name on the back) and place in bucket at register - or - give to Mrs. Gann from 5 to 7pm. Students – show your Elkins pride (T-Shirt or Hat) and earn 1000 extra points – Sign in with Mrs. Gann. Questions? E-mail me at sara.fina@comcast.net. See you Monday evening at Chipotle!!! ﻿Very Important! Please remember to mention to cashier that you are there to support the fundraiser for ELKINS HIGH SCHOOL and please put senior's name on receipt submitted to Brook Street BBQ ﻿from 2pm till CLOSING at 9pm! For Points: Pro-Grad parent (Mrs. Gann) will be there to collect receipt for points from﻿ 6 pm﻿ to 9:00 pm. Seniors, wear your Elkins T-shirt or Elkins Hat for bonus points! Hope to see you there!